They are the Point Jude Wobblehead. They come in two size 3/4oz and 1 1/2oz. Just like chitala383 is using. We cant tell by the pics. If your thread tension was good with the spiderwire you used to wrap them then you can catch some fish on them. If the tension was bad you are going to have hairs either broken or floating away as soon as they hit the water. After I'm done I pull on the hairs to pull out any loose ones. I usually pull out a few but for the most part they seem nice and secure. When you start wrapping coat the thread with your glue, then a few more wraps and repeat with the glue because the glue might not be getting absorbed into the threads. That's exactly what I do. I'm getting better, I think. Haha. It's a learning experience, and I'm having fun doing it. 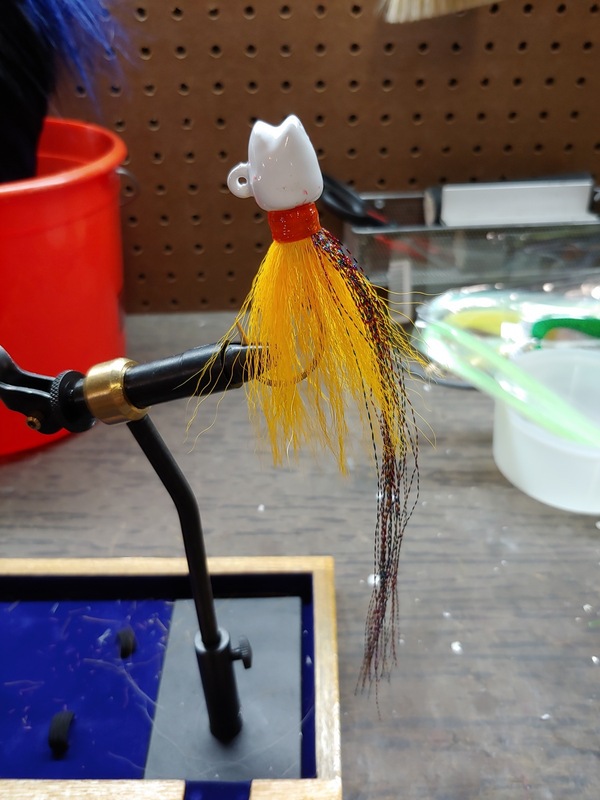 Chit, if you eventually try the tamden rig, remember to sparsely tie in bucktail on the hook and the shank extension otherwise there would be too much drag on the “tail” and you won’t get the wobble that the wobblehead is all about. My first was bulked up, did a test swim and didn’t like the results so I took a electric razor to it and thinned it out. Yeah I'm definitely gonna try that eventually. I got some of those articulated shanks. I want to hone my skills a little more before I try something like that. Good luck, show us more good stuff. I appreciate it but no, I'm good on tools. I bought a little fly tying tool kit. Thanks though. Tied my first smiling bill. I think it came out decent.